The JRZ damper is a race proven winning design, incorporating many years of experience in gas hydraulic damper and suspension design, applied to race cars ranging from F1, Indycars, GT and TransAm. Most modern racing applications call for effective damping control at very small suspension travels in combination with higher frequencies, which results in fairly low suspension velocities, indicating that the most important part of the damping characteristic is in the low piston velocity range, and this is exactly what this has taught us, a small change at a low piston velocity has a greater effect on handling that adjust the mid velocity range, and with this experience in mind JRZ has created a unique design incorporating the essential features to achieve maximal damping control and effective car handling. Now also available for track & street driven applications. 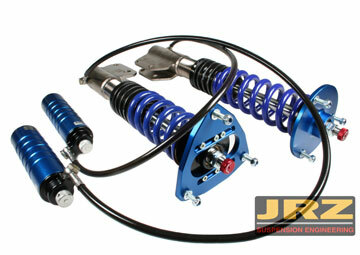 JRZ engineered the RS line of dampers for the driving enthusiast needing precise chassis control when driving on the track, as well as the street. Get the most from your track time by using the dampers engineered for track performance & street driving.